A tourist almost died when he was forced off balance by breaking waves as he stood on a one-tonne iceberg trying to take a selfie. The unknown man was risking his life in Iceland on Sunday when he climbed some of the stunning icebergs which litter a beauty spot called Diamond Beach. The location is popular with tourists from all over the world who come to see the huge chunks of clear blue ice which break off the massive Vatnajökull glacier into the Jökulsárlón lagoon. Each of the icebergs can weigh well over a tonne and they are constantly being tossed around by the freezing sea water. And as these pictures show they are not safe to play around on, if the tourist had slipped under the iceberg he could have been crushed to death. Local guide and photographer Kristján Karlsson hopes his images will warn others of the danger. He said: “For many people who come to Iceland they think it is like Disney Land, but it is a dangerous place. “Today, you have many people in the world being killed taking selfies and falling off rocks and things, this is happening, and in Iceland too due to recklessness and ignorance. “People are not aware of the natural forces we have in Iceland and they can be reckless. We have a lot of extremes and a lot of our natural attractions can be deadly if you are careless. Kristján, who also works as a graphic designer, had been taking a photo of the location when he saw the man. 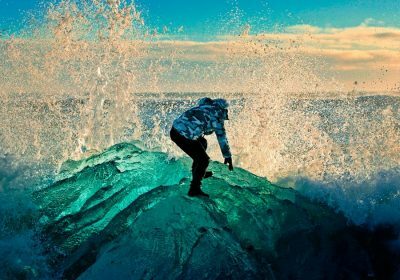 He said: “There was nothing I could do, I was taking a picture of the icebergs, but then the wave hit and luckily he was able to get out of the way.